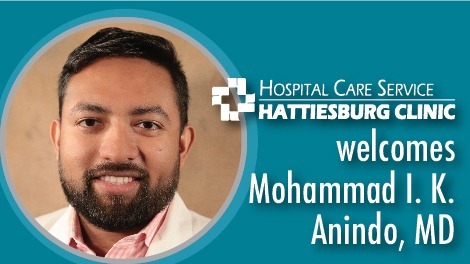 Mohammad I. K. Anindo, MD, recently joined Hattiesburg Clinic Hospital Care Service. Anindo provides evaluation and treatment for patients while they are in the hospital. He received his medical degree from Alfaisal University in Riyadh, Saudi Arabia. He completed an internship and residency at Ochsner Clinic Foundation in New Orleans, La. For more on Hospital Care Service or other physicians in this department, click here.